If you are a new reader, you may not know that Mat and I are obsessed with animals. If you are not a new reader, you may have already submitted an application for us to be featured on the show “Hoarders” due to our collection of animals. All readers being equal, this post is to tell the tale of our run in with some creatures at the Newport Aquarium and how I believe that it has magical baseball powers. The last off-day was probably my favorite day in a long, long time. In summary, we slept in, grabbed breakfast at First Watch, got a behind the scenes tour of the Newport Aquarium, grabbed late lunch at the Holy Grail, hung out and then went to Montgomery Inn for dinner. (That’s a whole lot of name dropping but, my point is, we had a Cincinnati day). Clearly, the most important thing to note here is WE GOT A BEHIND THE SCENES TOUR OF THE NEWPORT AQUARIUM. I’ll try to contain my excitement from this point forward. No promises. Next stop, shark feeding! If you have been to the Newport Aquarium, you know that they have a ginormous tank filled with all sorts of sharks, rays, shark rays (which are super freaking awesome, look them up if you’re into marine science) and a sea turtle named Denver. We put some rubber gloves on and fed those puppies some fish and it was AWESOME standing right over that tank and being close enough to touch them (we didn’t). No one with a beating heart can deny the cuteness that is a sea turtle (I wanted to jump in but realized this may total ruin our good standing with the aquarium so I refrained). It’s not just seeing, touching, or feeding animals that I love. I love learning about them. All I ever wanted to study my whole life was marine biology. I had shelves and shelves of scientific books about marine life and the ocean ever since I could read. However, since I was an honor class-taking, over-achieving, community-serving bum of a prude mathlete in high school, I decided that it was impractical to get a degree to work in a field that is very difficult to get a well-paying job in. I wanted a guarantee that I could be independent and successful after college. BIGGEST MISTAKE EVER. Although studying business and economics is gaining knowledge that’s universally applicable to most things in life, if it’s not your passion, it doesn’t really matter. This may be why 17 year old’s shouldn’t make life decisions and this may also be why I am such a weirdo these days. After years and years of trying to be a model citizen and make solid life choices, I realized that I wasn’t living for me and I can’t honestly describe a more lousy way of living. What I’m trying to say here is, listen to your heart when he’s calling for you. Moving right along… We were told that the next animal we were going to see might get us wet. In my mind, I’m thinking of something that splashes. We had seen all the big tanks, so I wondered what could splash us in the smaller tanks. Mini killer whales? Mini dolphins?! Nope! An octopus! She lives in a smaller tank in the back and, when the top is removed, she comes right over to the edge and almost over the top of the side to greet you. Brilliant! I was told I could touch her too so DUH… I went to give her a little handshake and she wrapped her tentacle right around my wrist. The suction on the underside of an octopus tentacle is no joke, people. Soon after that she began squirting water out of the tank like you see Orcas do at Sea World. Yes, I thought this was super cool. Yes, something may be wrong with my head. The octopus encounter had me elated until we went to dinner later that night. Mat’s a big fan of ordering calamari as an appetizer and I was super hungry so I took a bite. As soon as I bit down, Mat started saying “Nooooo, don’t eat me!” in his best high-pitched octopus/squid voice. Yeah. You don’t know trauma until you know what I felt like in that moment. Let’s never talk about that again. Now, I have heard tales about other Reds players visiting the Newport Aquarium and hitting walk off homeruns to win the game the next day, so I had a sneaking suspicion Mat might have a wicked good start the day after our visit. After giving up 0 runs in 7 innings against the Giants (yes, I had to go there, SF) after what we’ll call “Not Mat’s luckiest start of a season”, the baseball gods have spoken. The Newport Aquarium is magical. To say I wont try to force him to pet the penguin painting before his next start is a lie. p.s. If you haven’t been to the aquarium, I highly recommend you make a trip. It’s close enough to the ballpark that you can make it a double-whammy of an awesome day. Since we got an annual membership, I may be investing in fake mustaches and various other disguises so that I can go a few times a week. No big deal. p.s.s. 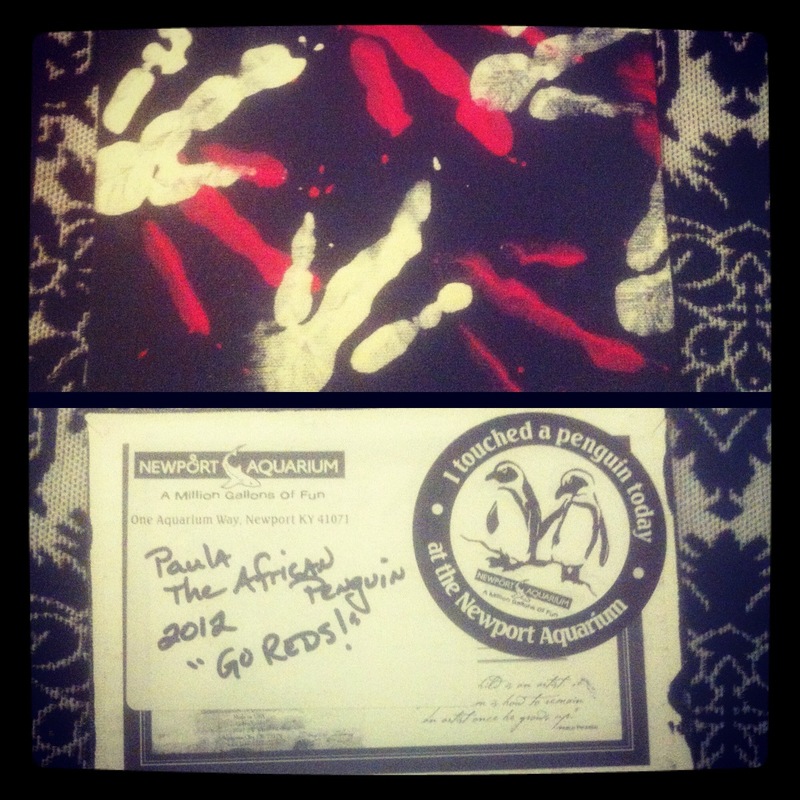 Thanks again to our wonderful friends @newportaquarium for the amazing experience! You haven’t seen the last of us! Mat pitched a fantastic game!! Thanks to both of you for coming to Cincy and I’m looking forward to the rest of the season. I love your posts! They totally make my day! I fully understand the penguin obsession. I have ridiculously huge collection of stuffed penguins and a totally random assortment of stuff that has penguins on it. I’ve been trying to convince my boyfriend that we should figure out a way to get one for years. Of course I’ve also been trying to convince him that a fruit bat would make an amazingly awesome pet too… Neither has gone over well. I am sure you both enjoyed this experience and will be going back often- next time get a pic of U loving on them penguins and share with us. Another great post. So glad you both had a great Cincinnati day! I love penguins and the art is completely adorable! I have to visit that aquarium now because I want one! And you are completely right about following your heart, too. Making lots of money isn’t actually much fun if you feel like you’re repressing your soul to do it. I just rolled three comments into one–hope the length isn’t unbearable! Thank you Dallas, that paragraph about chasing your passion and dreams really struck me, as I’m in college trying to decide on a major. Poly Sci it is!!! Screw finance. First-time visitor, blogger, and Cincinnati resident. Welcome to Cincinnati and Go Reds! As another lady who’s husband is also her best pal, I love reading your blog. It sounds like you and Mat have a fun, loving relationship. And I hear you about following your passions. Fortunately, there’s no such thing as wasted knowledge. The business studies will come in handy in many aspects of your life. And there’s no need for a degree to indulge in your real passions, especially with such a great aquarium nearby.